I think you’ll all get a kick out of this one – today we’re looking at Bob Dylan’s “Christmas in the Heart.” Yes. Bob Dylan really did record a Christmas album. And yes, it is awesome… Remember to visit this page at any time for a collection of all 25 Reviews of Christmas articles. “Christmas in the Heart” may very well be the most entertaining Christmas album ever recorded. Seriously, it’s a hoot. 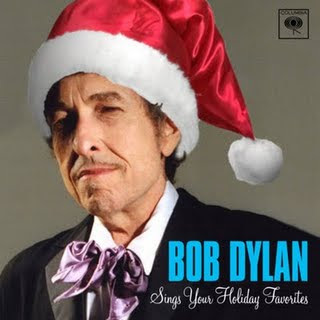 The idea of Bob Dylan recording a Christmas album isn’t that much of a stretch. Dylan isn’t just an artist with folk roots, but one of the biggest, most knowledgeable fans of folk music on the planet. Sections of his memoir, Chronicles, read like introductory courses to the world of folk as he rattles off dozens of artists and the impact they had on his work and the 1960s folk scene. Folk’s influence on Dylan’s work is obvious, and even though he mostly releases original material, he has on occasion filled records with folk standards. When one thinks about it, Christmas and folk songs aren’t that far apart. Like folk music, Christmas songs are passed down through generations, filled with tradition and history; they survive because they are infectious, probably bearing a greater appeal to performers wishing to put their own stamp on the material than to listeners who hear the same songs over and over again. If Justin Bieber can release a Christmas album, then it’s a no-brainer for a lover of passed-down music like Bob Dylan to tackle the material. There’s just one problem. Bob Dylan of 2009 isn’t the Bob Dylan we remember from the 1960s. Or the 70s. Or the 80s. Dylan’s been around an awfully long time, and though I contend he’s still a ridiculously talented songwriter, his voice has…um…how do I put this lightly….suffered. Dylan’s singing has never been mistaken for beautiful, but the Dylan we’re familiar with had an iconic voice: raw, immediate, and hypnotic. Could he always hold a tune? No, but he didn’t need to, because he owned his songs with that voice; the conviction, expression, and earnestness with which he sang brought out the beauty in his brilliant lyrics. Then the mid-90s rolled around, and Dylan suddenly sounded as though someone had dragged barbed wire through his vocal chords. His voice is now unrecognizable: raspy, hoarse, croaky, and limited to an incredibly small range. Dylan still does his best to own the voice, and much of his expressive quality is still there, but nevertheless, there’s really no defending Dylan’s voice anymore. It’s bad. As a Dylan fan, I find it somewhat endearingly bad, and much of his latter-day material makes excellent use of his voice’s unique quality. But one thing is for sure. It’s a voice that is 100% unfit for Christmas music, and that makes “Christmas in the Heart” a wonderfully peculiar gift. To Dylan’s credit, he understands the material quite well. His selection of songs strikes a nice balance between frivolous standards like “Here Comes Santa Claus” and substantive hymns such as “Hark the Herald Angels Sing.” Like James Taylor, Dylan understands that quality Christmas albums must provide more than easy Radio fare, and he’s clearly packed the record full of songs that express what he finds meaningful at Christmas. And because he’s Bob Dylan and can do whatever he wants, he also throws us the occasional curveball such as the Hawaiian-fused “Christmas Island.” The lavish production is a complete departure even from Dylan’s latter-day work, but it fits; Dylan is going for all out grandiose, but he’s doing it across the board, and the enthusiasm is rather charming. It also has to be tongue-in-cheek at times; how else does one explain the choir of young, clear-voiced women accompanying him on many tracks? In any case, the songs are well sequenced, creating variety from each track to the next, and at 42 well-paced minutes, it never overstays its welcome. But the star of the show is Dylan’s singing, completely at odds with everything the album has to offer. Even at his height, Dylan’s voice wouldn’t be able to keep up with the extravagant production; now rough and coarse and completely uneven, his voice horribly clashes with the music, and were I grading the album on purely technical merits, I would say Dylan’s singing sends the album down in flames. But that would be ignoring how much fun it is to hear gravelly old-man Dylan perform these songs. It’s easy to imagine what these songs sound like; the sound you have in your head of modern-day Dylan croaking “pa-rump-a-pum-pum” on “Little Drummer Boy” is exactly what you get, and it’s an irresistible blast to listen to. Like watching a B-level monster movie, one doesn’t listen to “Christmas in the Heart” for quality performance, but because it’s so bad it’s good. He can barely get through many of these songs, his voice breaking with any transition larger than a half-step. But Dylan doesn’t care: he goes for it every time, singing playfully on “Here Comes Santa Claus,” solemnly on “Adeste Fidelis,” and jubilantly on “Must Be Santa.” Never mind that his voice can’t keep up with his energy – Dylan won’t let anything hold him back. That audacity is amusing in and of itself, but the surreal train-wreck effect it creates is what makes “Christmas in the Heart” essential listening. Every last song on this album is hugely entertaining. “Hark the Harold Angels Sing” is sidesplittingly funny, “Silver Bells” is wonderfully uncomfortable, and “Christmas Island” may be a minor comic masterpiece. To me, though, “The First Noel” is the record’s defining track. Dylan struggles his way through the verses, and on the chorus, a clear-voiced, angelic choir takes over, with Dylan scratchily delivering the same lyrics out of tune and tempo in the background. It’s the sloppiest counterpoint I’ve ever heard, but also the most hilarious. The amount of cheese Dylan lathers on to some tracks convinces me he crafted at least parts of the album with his tongue planted firmly in cheek, but struggle though he may to get through “Do You Hear What I Hear” or “Little Town of Bethlehem,” he also has a clear affinity for these songs, a passion that never fails to shine through. 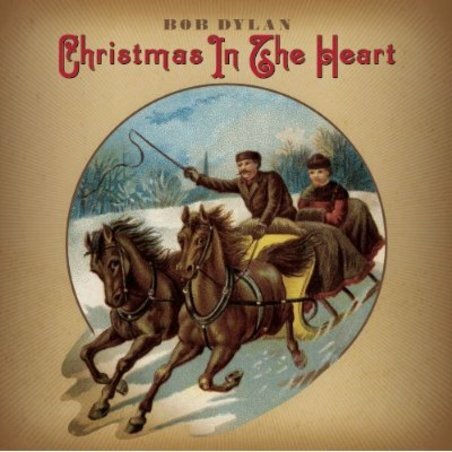 “Christmas in the Heart” might very well be 50% parody, but as the title suggests, Dylan draws the other 50% from his very soul. That doesn’t make his voice sound good, but it adds a touch of poignancy to these entertainingly inept performances. “Christmas in the Heart” is the perfect album for people who love Holiday music but are sick of the same-old-same-old; Dylan certainly shakes things up, and most importantly, he does so while delivering an engaging Yuletide experience. Whether this was on purpose is beside the point. “Christmas in the Heart” is essential listening; get a group of friends together and break out the eggnog. It’s sure to be a grand old time. I completely agree. I love this album, and I'd much rather listen to this than the usual mock-classical pop crossover blandness that tends to hit the charts around this time, from artists who are never listened to again.